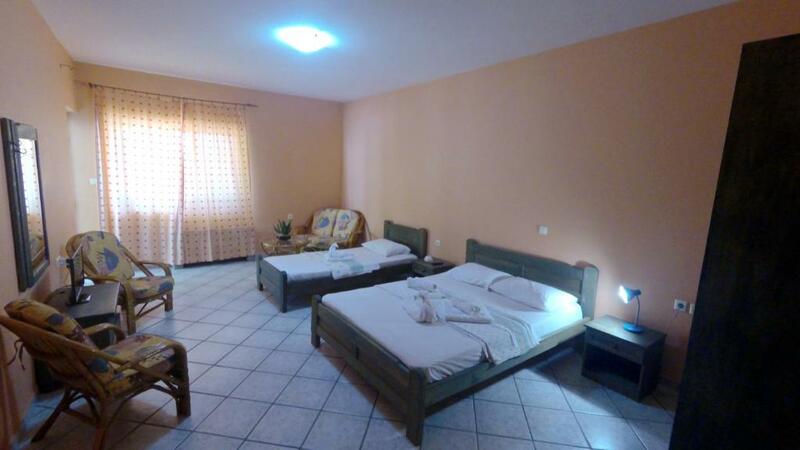 Very nice rooms with a lot of self catering facilities in a quiet location. Very friendly owner. 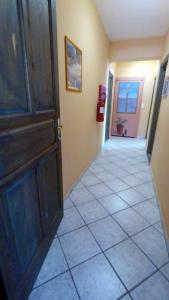 The place is very well equipped, the room is larger than in any other places, and it is very clean. The staff cleaned the room every day and the towels were changed daily. The swimming pool is also very clean. The staff is very kind and prompt! We had an accident with the door but the people fixed the problem and we even didn’t understand when the job was done :) Thank you and see you again! Evharisto! Beautiful room decoration. It was a surprise! Nice hotel in general. Nice balcony with pool view. Everything. The owner is very kind and helpful. Rooms are very clean and spacious. Really nice staff. Clean and comfortable. Big room and balcony. Il nostro monolocale era molto grande, davvero pulitissimo(tutti i gg, cambiavano asciugamani e svuotavano la pattumiera, e ogni tre gg venivano a pulire); la cucina piccola ma con tutto l essenziale per cucinare. Il bagno pulito e nuovo.(doccia). L hotel è in una posizione a mio parere, ottima: 1.5 km da karistos e da tutte le splendide spiagge di evia. Il supermercato è a 600 mt, la farmacia di fronte alla struttura. Il proprietario e la sua impiegata sono stati di una gentilezza e disponibilità spettacolari: ci hanno permesso di restare anche oltre l' orario in cui avremmo dovuto lasciare l hotel,così abbiamo potuto fare un ultimo bagno nella piscina(pulitissima). Che dire: ci siamo fermati solo nove gg ma avessimo potuto,saremmo restati molto di piu; non escludo che torneremo il prossimo anno per finire di esplorare la stupenda evia!! Bon internet , très spacieuse moderne chambre, belle piscine, Parking libre. Μονο καλα λογια μπορω να πω. Το προτεινω ανεπιφυλακτα! Lock in a great price for Hotel Zeus – rated 8.4 by recent guests! 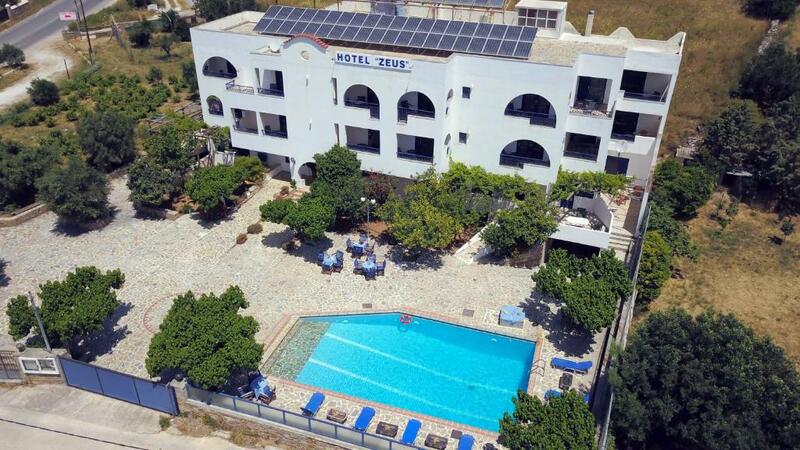 Hotel Zeus This rating is a reflection of how the property compares to the industry standard when it comes to price, facilities and services available. It's based on a self-evaluation by the property. Use this rating to help choose your stay! Hotel Zeus is just 2 hours from the center of Athens, 6 miles from the harbor of Marmari and 2 minutes from the crystal waters of Karystos. Located in a vineyard estate with ample parking and a garden, the Hotel Zeus features a swimming pool, breakfast room, bar and a children’s playground. The Zeus features fully equipped rooms with central heating/ air conditioning, TV, kitchenette facilities and balcony with pool, garden or sea view. When would you like to stay at Hotel Zeus? 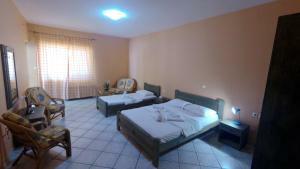 Air-conditioned room with a TV, kitchenette facilities and balcony with pool, garden or sea view. ΑΝΟΙΚΤΗ ΥΠΟΔΟΧΗ ΕΠΙ 24 ΩΡΕΣ! ΥΠΗΡΕΣΙΑ ΓΙΑ ΓΡΗΓΟΡΗ ΑΝΑΧΩΡΗΣΗ (EXPRESS CHECK OUT SERVICE)! ΥΠΗΡΕΣΙΑ ΜΕΤΑΦΟΡΑΣ ΑΠΟΣΚΕΥΩΝ! ΕΠΙΧΕΙΡΗΜΑΡΙΚΟΤΗΤΑ ΚΑΙ ΑΓΑΠΗΜΕΝΟ ΧΟΜΠΙ ΤΟ ΨΑΡΕΜΑ! ΥΠΑΡΧΕΙ ΒΕΝΖΙΝΑΔΙΚΟ ΚΑΙ ΦΑΡΜΑΚΕΙΟ ΣΤΗ ΓΕΙΤΟΝΙΑ ΜΑΣ! House Rules Hotel Zeus takes special requests – add in the next step! Hotel Zeus accepts these cards and reserves the right to temporarily hold an amount prior to arrival. Hotel is simple and old-fashioned but totally ok for few night stay.